On March 19, 2011, about 11:15 Pacific daylight time, a Cessna TU 206G, N6169Z, sustained substantial damage to the forward portion of the fuselage and empennage during a forced landing following a loss of engine power while in the airport traffic pattern at the Pierce County Airport – Thun Field (PLU), Puyallup, Washington. The certified flight instructor and commercial pilot receiving instruction sustained minor injuries. The airplane was registered to the Civil Air Patrol and operated as a local instructional flight under the provisions of 14 Code of Federal Regulations Part 91. 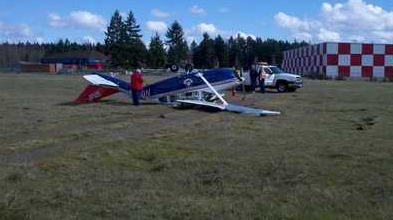 Visual meteorological conditions prevailed and a company visual flight rules flight plan had been activated for the local flight that departed from Puyallup. A representative from the operator reported that the pilots performed the pre-landing checklist, and switched the fuel selector to the right tank position and activated the auxiliary fuel boost pump while on the left midfield downwind for landing on runway 34. Shortly thereafter, while turning from base leg to final, at 900 feet mean sea level (msl), the airplane began to sink and full engine throttle was applied. The engine subsequently did not power up, and the airplane collided with up-sloping terrain approximately 400 feet short of the approach end of the runway. The nose landing gear collapsed, and the airplane subsequently nosed over. The airplane was equipped with a Continental TSIO-520-CCM engine. The engine is turbocharged, fuel injected and equipped with a constant speed propeller. The airplane’s fuel system incorporates a 2-stage electric auxiliary fuel boost pump. The fuel pump is placarded “emergency” and “start” and is utilized for engine starts and engine related emergencies. A representative from the engine manufacturer reported that operating the auxiliary fuel boost pump at a low engine power setting would “flood” the engine and result in a loss of engine power. Post accident examination of the air frame and engine revealed no pre-accident mechanical malfunctions or failures that would have precluded engine operations. An engine examination report is contained in the public docket for this case file. The airplane was on the downwind leg of the traffic pattern during an instructional flight and the pilots performed the pre-landing checklist, switched the fuel selector to the right tank position, and activated the fuel boost pump. According to the flight instructor, the airplane “began sinking” while on final approach for the runway. When the pilots tried to add engine power, the engine did not respond, and the airplane collided with terrain short of the runway. The manufacturer’s approved checklist for the airplane indicates that the auxiliary fuel boost pump should be in the off position before landing. A representative from the engine manufacturer reported that operating the auxiliary fuel boost pump at a low engine power setting would “flood” the engine and result in a loss of engine power. It is likely that when the pilots applied power, the engine was flooded, which resulted in the total loss of engine power. Post accident examination of the air frame and engine revealed no pre-accident mechanical malfunctions or failures that would have precluded engine operations. The pilots’ activation of the fuel boost pump while preparing to land, which was contrary to checklist procedures and resulted in a loss of engine power. Be the first to comment on "Loss of Engine Power by Washington Wing Plane"